Are you tired of trying to juggle family, career, and maintaining a beautiful home? Is your energy bill taking too large a chunk out of the monthly budget? Hi, I'm Ron Vinzant - professional handyman and certified building analyst. 1) to help you, the busy homeowner, to maintain a beautiful home through updates and repairs. Whether you need a faucet replaced, a ceiling fan hung, some random repairs, or a complete FREE home energy audit, I am ready to help you! My handyman skills have been developing since my teen years as I have always had an affinity for tools and how things work. This is when I developed a passion for “fixing things”. During that time I gained many handyman skills including operating power tools, welding, carpentry, and general maintenance. In my 20s I gained a wealth of experience in welding; hanging steel; building metal buildings; landscaping; and operating heavy equipment such as back-hoes, trenchers, and scissor lifts. By 30, I owned my own glass business. I built much of our family’s first home, served the handyman needs of my aging in-laws, neighbors, and single female family members. In addition, I served on construction crews for many years in Mexico on mission projects. After moving to the west coast in my 40s, I started a heating and air conditioning consulting service, while managing and maintaining rental properties since 2005. Until recently, I served as a residential energy analyst/auditor for our local major energy provider. 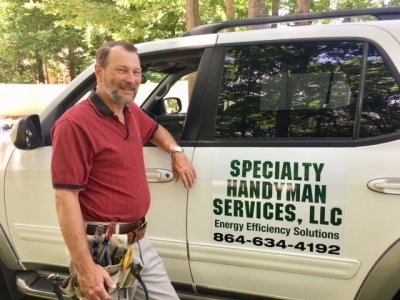 What I discovered in the many thousands of homes I audited was a critical need for a quality craftsman...someone who could not only recommend solutions to my clients BUT ALSO implement the energy efficiency designs that I was recommending. At this point, I decided to launch Specialty Handyman Services in order to meet the need. My formal training includes Building Performance Institute (BPI) certification as a building analyst by the nation’s premier standard-setting organization for home performance professionals. Therefore, I can show you where your home is costing you money... and then provide you with some simple solutions to help stop the energy and money drain!! I am also fully insured and bonded. In summary, I have experiences from a wide range of personal, volunteer, and professional venues from which to draw in order to help you with your specific needs.​ And if there is not a simple solution, I am good at MacGyvering! 2-refreshing your home environment through updates, repairs, or maintenance. Dependability - I am punctual and accurate with agreed date, time and venue. If I am unavoidably delayed I will advise you in advance. Communication - I will maintain communication with you from start to finish, always keeping you in the loop. My background in energy efficiency provides you with professional strategies for your specific home and the help you need to implement cost effective solutions that will save you on your energy bills.